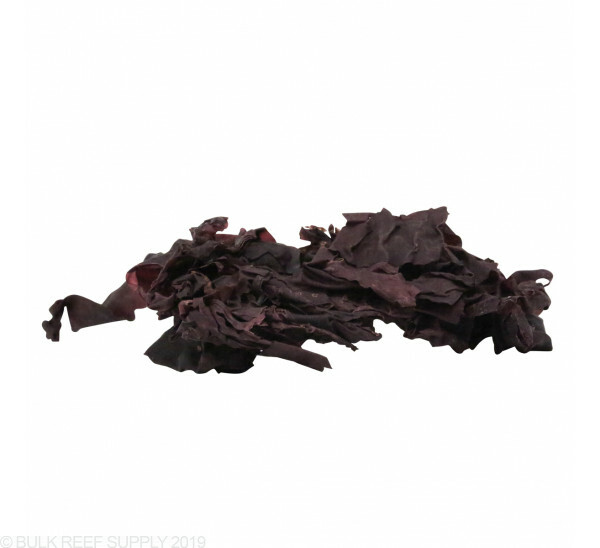 Red (Palmaria palmata) Sea Veggies Seaweed is nutritious, completely natural seaweed for marine herbivores such as Tangs and Surgeonfish, Moorish Idols, Parrotfish, Angelfish, and Butterflyfish. Fish that are known as herbivores or omnivores will naturally graze on algae throughout their day on the reef. By offering sheets of dried seaweed "Nori" will help mimic the natural foods that your fish could consume. 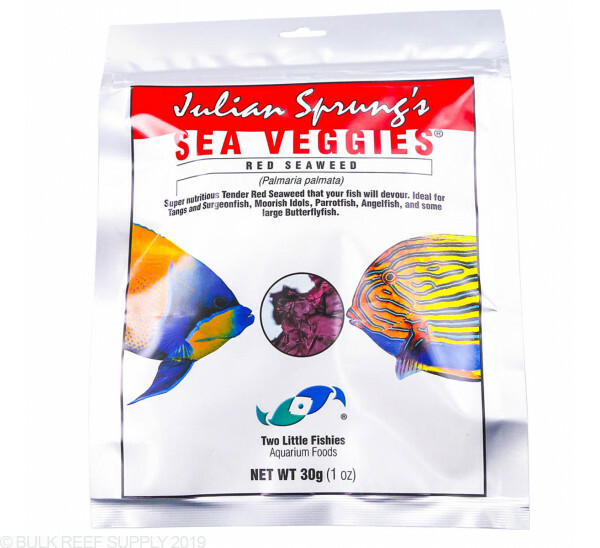 With the different types of Sea Veggies available you can completely round out your fish's diet by offering all three types from day to day. The texture is like thin, smelly, beef jerky, my tangs and foxface love it! I just stuff it in a BRS DIY mesh feeder and they tear it up. I rubber band the stuff to tonga rock, add garlic power and selcon, then drop it in the tank. My fish eat the stuff up. It is a bit messier than sheets used in mesh. As John said in the other review, if you're expecting sheets, you will be disappointed. I didn't read Johns review before I purchased this, although I should have. It works fine, it looks and smells like chewing tobacco. Yes, I tried it. No, it doesn't taste like chewing tobacco. You do have to chop it up or blend it to make it work, it doesn't do well on the veggie clips. I cut a long piece off and put it on the veggie clip and my yellow tang swam away from it rather quickly and then stared at me like I stole his candy. 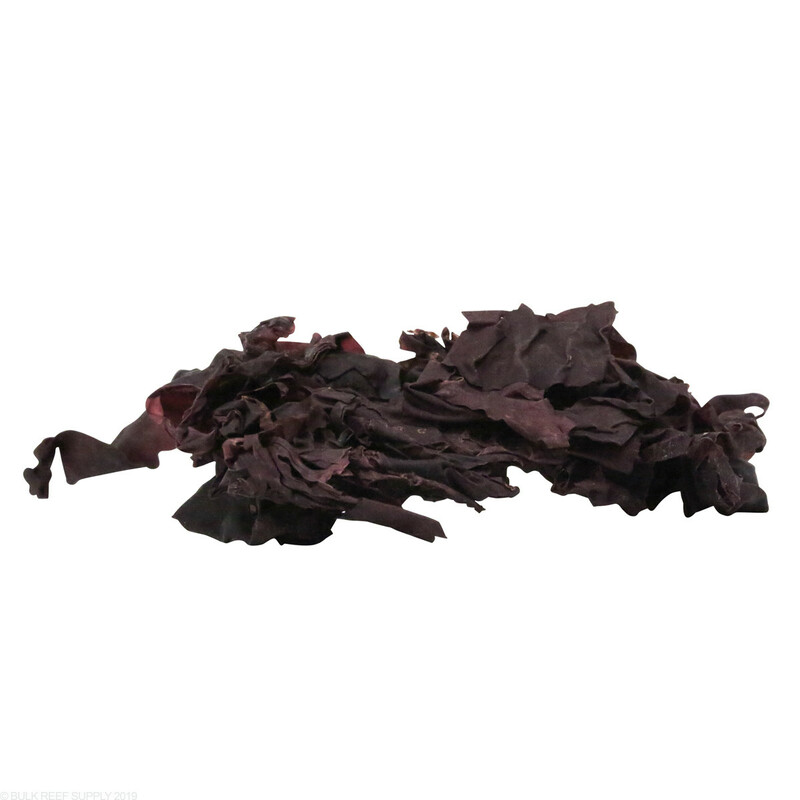 If you're expecting processed sheets of nori, Red Sea Veggies will be difficult for you to figure out. It comes in its natural state so it looks something like Red Man chewing tobacco. It's in a more natural state and you have to cut this stuff to serve it. Tear a pinch off, throw it in a bullet blender for 45 seconds and soak it with the other foods you are defrosting for a few minutes and it's good to go. If you have tangs or surgeonfish, chop a small amount of green, red, and purple together into small 2-4 mm pieces. Before soaking the chopped mixture with the other food, add a few drops of Selcon and let it get soaked up by the veggie mix and you'll have the fattest, healthiest tangs around. Comes in random leave shapes instead of sheets like the purple and green seaweed. Red seaweed does not stay on the clips very well, difficult to use. Fish don't like it as much as the other types. Lots of nori in this pack! The sheets are huge! I 1/4 them up! Angel and tang and engineer goby line up at the edge of the tank for this. The are aggressive eaters and devoir it in seconds. So I think they like it! 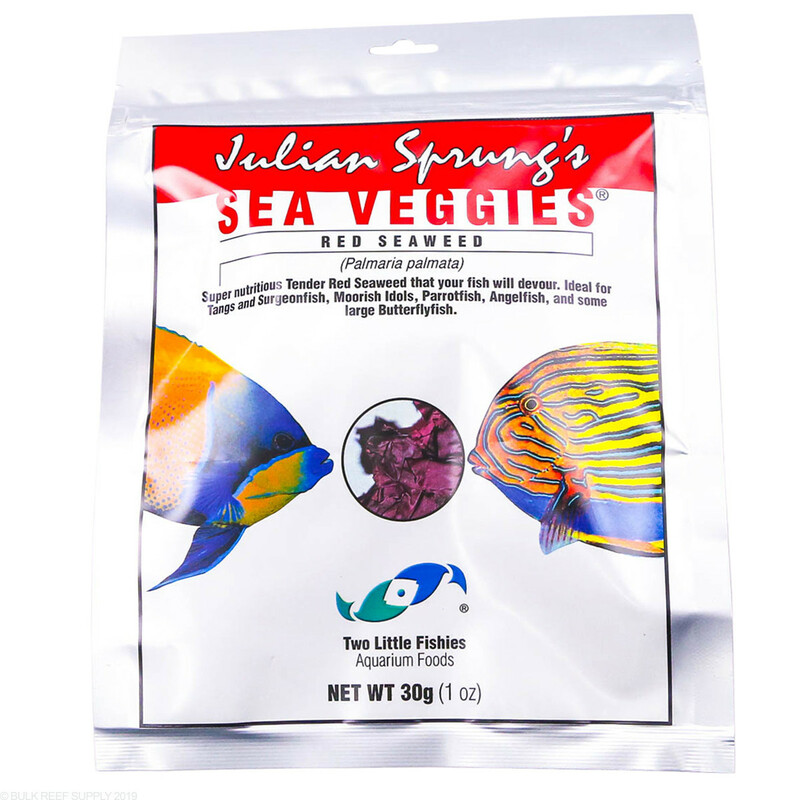 I keep a pouch of Sea Veggies in fish supply cabinet always. My fish love this stuff. They prefer the green or purple and I mix the two at times for them on veggie clip. I cut the sheets into 3 strips. I normally put a drop of Garlic Extreme at each end of the middle strip and lay the other two on either side of it folding it over twice and inserting it into the flip. They devour it in less than five minutes (much less). Every fish eats it except for the Harlequin Tusk and the Psychedelic Mandarin Fish. I tried the red seaweed and they did not care for that one too much. 2 large tangs eat 1.5 sheets per day. Tried sm pouches 1st to test ted, green, & my yellow & hippo devour purple sheets. OMG my fish went NUTS for this stuff!! They had been eating other brands well but I read the reviews and wanted a better value since I go through a lot of veggie sheets so I figured I would try this out. My fish were literally fighting each over to get to this stuff! My Anthias, Tang, Blenny, even Clowns ate it like there was no tomorrow. Very happy with the results :) Oh and I feed my tank 3 to 4 times a day since I have Anthias so it's not like they were starved they are just pigs! My tangs and clowns love it as does some of the cleanup crew. Definitely worth it! My tangs prefer the purple sheets over the green. Either way, they love both!